WD's latest hard drive is fantastically fast, but at what cost? The release of the new Western Digital Caviar Black 2TB hard drive is designed to put non-SSD drives back in the limelight. Western Digital labels its desktop drives within three different brands to make the benefits of each device clear to the consumer. The Blue editions are the mainstream offerings, the Green versions are for those more environmentally minded PC users, and the Black editions are optimised in order to offer up the best possible performance. The WD Caviar Green was the first hard drive out of the gate to come in a 2TB trim. It performed well enough, but for obvious reasons, the expectations are much higher for this Black performance drive. In keeping with Western Digital's branding, the Black edition of the Caviar drive isn't anywhere near as environmentally friendly as the Green edition – it has neither the 40 per cent reduced power draw nor the slower spindle speed of its earlier and more conscientious sibling. It does, however, pack an incredible punch in the performance stakes thanks in part to a huge 64MB cache and two-stage actuator to make seek times speedy. It isn't quite SSD level fast, but compared to your average hard drive it has a serious turn of speed. 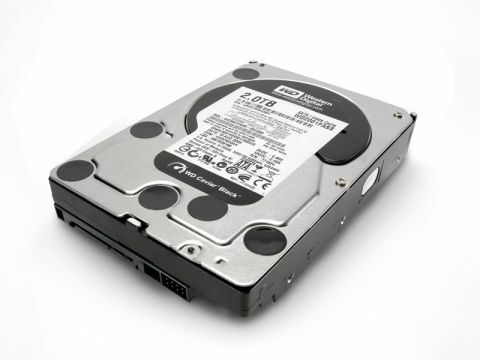 Western Digital has crammed 2TB of storage into the Caviar Black by using four 500GB platters spinning at 7,200rpm. In testing (using HDTach) we saw an average read and write performance of 113.1MB/s and a random access time of 11.3ms. It achieves this incredible seek time thanks to a new dual-stage actuator that combines a fast course movement with a finer precision stage that completes the seeking. There are a couple of downsides, though. The drive can be loud, and it can run hot. WD covers the drive with a generous five-year warranty, though, which should be enough for most users. While performance certainly helps the cause, hard drives aren't only about speed, and this is where we bump into a fundamental problem with this new drive – its price. The Caviar Black 2TB edition is just a little too expensive for serious consideration at approx £250. There was a time when this would have been a bargain, but the market has moved on considerably since then. The standard capacity for new platters rolls in at the 1TB mark, and this forms the sweet spot for internal drives too. This has driven prices of 1TB drives down significantly – you're looking at spending as little as £54 for such capacities, making the Caviar Black look outrageously costly. There will certainly be specific setups that will demand large storage capacities in a single 3.5in drive enclosure, and if money isn't an issue then there's clearly a lot to like here. Even so, for the vast majority of users a pair of 1TB drives will do the same job and cost half as much. Worse than that, you could grab three drives and set up a potentially more reliable RAID-5 array with the same capacity for less than the asking price of just this one drive. What Western Digital has managed with the release of this 2TB drive is to highlight the great value that there is to be had from the 1TB hard drive market. All of the major manufacturers produce drives either side of the £60 mark, and they all offer incredible value for money for most day-to-day uses. 1TB should certainly last you a while as well, and as we move more and more towards cloud-based storage, it could be enough to last you on your client side for several years to come. However, that's not all that the Caviar Black has highlighted. The sheer performance and capacity on offer here shows that the hard drive market has a few milestones to pass before SSDs take over. Price points are incredibly sensitive, though, so such advances need to make financial sense outside of a few niches.